Use a fry pan with ovenproof handle, heat over medium heat and spray the pan with oil. Add sliced onion and capsicum and sauté until semi soft. Add ham, sauté for a further minute or two then place eggs on top. 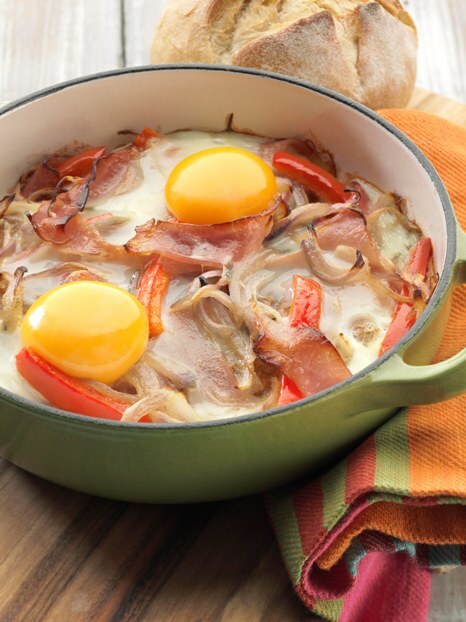 Place in the oven and bake until eggs are done to your liking. Remove pan from the oven and place pan onto a heat resistant surface. Eat straight out of the pan, be careful, as the handle will be very hot. Serve with one small wholemeal crusty bread roll. Tip: Add other vegetables such as mushrooms, celery and spinach.